Adobe Photoshop Sketch Video Manual on Vimeo On Demand. 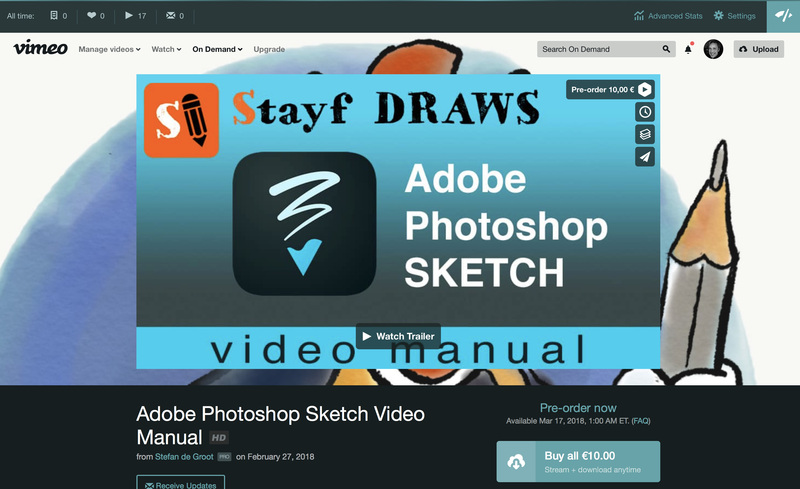 It is the new video manual by Stefan de Groot from Stayf Draws. Learn all the features in version 4.5 from Adobe Photoshop Sketch. It is an app you can download for free in the AppStore and Google Play. Learn how to create a free account at Adobe Creative Cloud. Learn the interface of Adobe Photoshop Sketch. Learn how to make a new canvas and how you can later crop it. Discover the way you can use the brushes and even import custom Photoshop brushes from yourself or the awesome brushes of Kyle T. Webster. Choose your color in many different ways and use the Color Scheme Generator. Use the ruler to draw straight lines, or all the basic shapes to create images fast. Use the perpsective grid and draw everything in perspective, using three vanishing point with the ruler, but also draw all the shape templates in perfect perspective. Use several layers and transform your artwork. Paint inside objects. Export your artwork to Creative Cloud or any other Cloud Service. Learn how to export a time-lapse video of your artwork. Learn how to import images from Adobe Stock and Adobe Market. Customise your General settings and send your file to your desktop and open it in Illustrator or Photoshop. If you want to learn everything about drawing and painting in Adobe Photoshop Sketch buy the Adobe Photoshop Sketch Video Manual by Stayf Draws.